Welcome to these Judy Garland Quotes of the Day from my large collection of positive, romantic, and funny quotes. You are never so alone as when you are ill on stage. to feel like throwing up in front of four thousand people. and put to death by reality. If you have to be in a soap opera try not to get the worst role. I've seen the ticket, and I still can't believe it. When I see the money, I hope I don't hit the floor. 'Twas not my lips you kissed but my soul. I was born at the age of twelve on an MGM lot. How strange when an illusion dies. It's as though you've lost a child. I think there's something peculiar about me that I haven't died. It doesn't make sense but I refuse to die. I think I must have been crying for some attention. I'm the original take-orders girl. 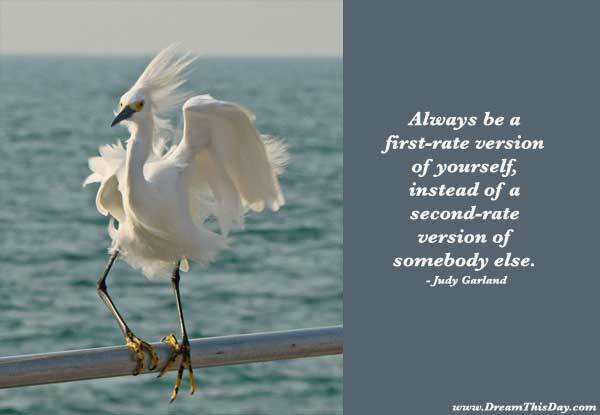 Thank you for visiting: Judy Garland quote of the day.